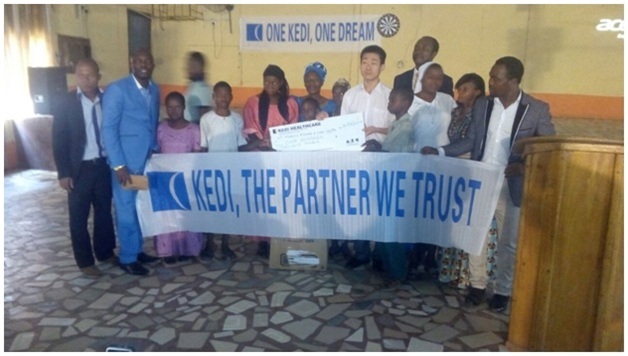 Corporate philanthropy: 2015 was a beautiful year for KEDI Healthcare Industries Nigeria Limited and just like always, the company donates to charity throughout the year. It made various cash and products donations in fulfilment of the company’s Five- Year Development Program which was launched by the Company’s President Mr William Zhao in June 2014. The company donates to charity through the Five Year Plan amount to N15,000,000, which is for special relief institutions and schools. The plan also includes Education Scholarships up to the tertiary level, Insurance Scheme worth N10,000,000 per beneficiary and other Philanthropic and Development Programs for her distributors. This gesture was borne out of the corporate philanthropy need to impact the society by helping the orphans, physically challenged and elderly who are the most vulnerable members of the society. KEDI Healthcare is a company that thrives by spreading health and hope and is often referred to as the best Multilevel Marketing Company in Nigeria because of the difference in their style of business. For KEDI, the efficacy of her products remains the company’s strong feat; and this undoubtedly contributes to the general well-being of mankind. KEDI Healthcare’s never relenting drive extended her hands to the orphanages, schools and other places where the hope of a beautiful tomorrow is bleak. Her goal to foster Wellness and Wealth is unravelled by any other in the industry and their Five Year Plan make it a force to reckon with among Charity organizations . To support that effort in 2015, KEDI Healthcare donated to various bodies the sum of N1,500,000 cash in total and products worth N600,000. This support which was provided to six different relief and child supporting institutions across five different states is believed to provide these orphan children with a chance to enjoy a standard of living that is well appreciated. It also comes as a big support for those who embark on these child relief activities. The beneficiary institutions are Otobotob Orphanage Home in Calabar, Cross River State, Abuja Children's Home, Abuja, Pro Labore Dei Orphanage, Enugu state, St.Mary's Rehabilitation and Development Centre, Osun State, The Catholic Relief Centre and Chief Agbaje Memorial School both in Ibadan, Oyo state. In total for the year with their corporate philanthropy, KEDI not only reached out to these people with financial support, but with moral support and with the Management reaffirming Nigerians and Africans at large that they will never withdraw from their promises to support the less-privileged in Africa; the momentum is surely going to keep rising. KEDI in their corporate philanthropy remains passionate about her responsibility in building the next generation, to be full of hope and life especially in Africa, which is why donations to those institutions that push for such vision, is the company’s primary philanthropic initiative. The company donates to charity and believes that as our world expands and evolves, we are proud and excited about our company’s future and the opportunities we all have to contribute to a strong healthy community and a sustainable world.